When you are applying to a residency medical program you are applying to one of the final and most important steps in your medical education journey. These programs are extremely competitive and require students to truly impress the medical residency admissions board with their program application. Whether you are applying to a medical genetics residency program, a pathology medical residency program or anything in between, one of the most important components of your application is the medical residency personal statement. The statement is important because it helps admissions boards separate students from one another and determine if a student is a well-rounded individual deserving of acceptance. Since the admissions boards have so many medical residency applications to look through it’s important that your personal statement stands out and gets your application noticed. Getting accepted into the best anesthesiology residency programs in the United States requires a solid medical residency personal statement. If written correctly, the statement will get the attention of the admissions boards, show them who you are as a person and show the board that you are a well-rounded student who has a strong command for the English language. However, if you submit a generic personal statement, it can likely get lost in a pile with other student applications, even if you have the academic background necessary. The right personal statement can be your key to acceptance into one of these programs which is why we offer professional medical residency personal statement writing services. What Is Your Personal Statement for Medical Residency? Many applicants will turn to our medical residency personal statement services due to its importance. It is the only part of your application in which you can market yourself in your own words. The committee will want to know more about you than simply grades, so a well written statement that shows how well you will match their residency program can go a long way. However, writing a good statement is far from easy task and many applicants need the help of our medical residency personal statement writing services. We can help you to ensure that your statement will grab the attention of the admission committee and show you as an excellent match to their requirements. What Should You Be Including in Your Medical Residency Personal Statement? A personal statement is very much written about you. However, it still needs to reflect what the committee are looking for if you are to show them your suitability for their program. So before you do your writing you must always do your homework so that you know just what they see as a good resident. Why you are following the medical specialty that you are applying to. What you have already done with regards to education and training in this area. What makes you an excellent practitioner in this specialty. Why you are applying to the specific program. What your future career plans are. What Should Be Avoided in Your Personal Statement Writing? Never use clichés: these rarely mean anything and the committee will be looking for your statement to be unique. Don’t make statements that are blatantly obvious: if it does not add any real value then it does not belong in your statement. Don’t use anything other than formal English: avoid any slang, acronyms or text speak. Don’t use your statement as an opportunity to make excuses or to complain. Don’t fail to proofread: a single mistake can be enough to have the reader moving to the next in the stack of applications. The bottom 10% are poorly written with grammatical mistakes, spelling errors, a lack of organization, or some combination of the three; these will truly hurt your chances for an interview – some committees have a zero tolerance policy for spelling or grammar errors. 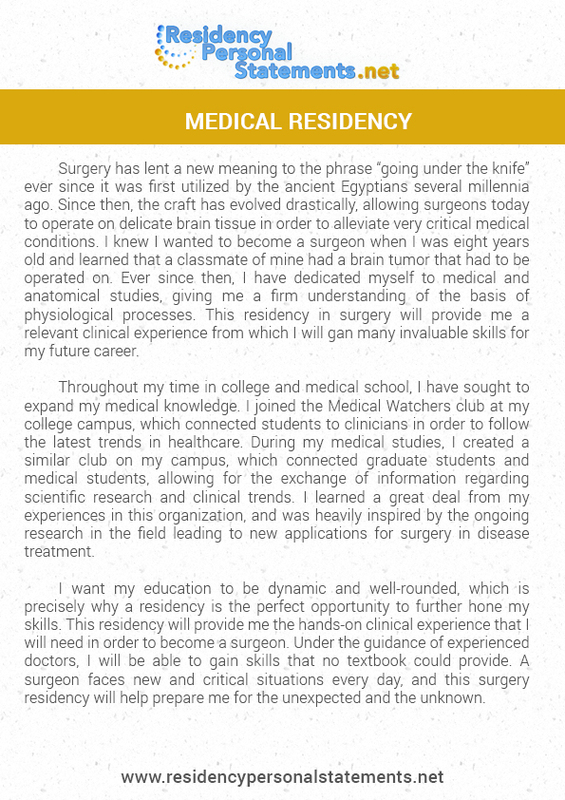 The medical residency personal statement can be any person’s key to acceptance into a medical residency program. With so much emphasis placed on these essays, you will want to make sure you turn to a professional for help. This is why we have created an experienced team of experienced residency personal statements writers who are not only talented at writing but who have an understanding of what it takes to be accepted into one of these medical residency programs. What Services Can We Provide for Your Personal Statement? Personal statement writing: our writers will help you to carefully target the medical residency that you are applying to. They work directly with our clients to get the best results and you will always have your writing done from scratch in an engaging manner. Not simply written to a generic template or copied. Editing of your residency statement: how you write is as important as what you have covered. You have to get the reader’s attention and make them impressed with what you have to say. Our editors will help you to ensure that your writing is spot on. Formatting help: getting your statement structured and laid out according to requirements is also important. We always ensure that your formatting will be just what is required with no issues. Proofreading of personal statements: we offer certified proofreading through experts that will methodically review your work. At the end of their review you can be assured that there are no issues with your writing. When you come to us for help with your medical residency personal statement you will have our entire team of professionals working together to help you. This means you get the personalized writing and editing assistance of one of our writers as well as the individual attention of our customer service representatives who are here to help make sure all of your questions are answered. 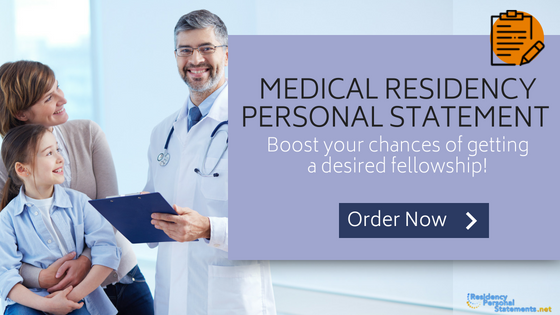 Get in touch with our medical residency personal statement services today to ensure that you get interviewed and ranked well for your targeted program.